Please join us for our Lunch and Learn Webinar series presented by the Milano Management graduate programs at The New School. Can mindfulness and contemplative practice provide a framework for effective leadership development? In this webinar, Dr. Poonamallee will provide and overview with examples and results of mindfulness-based leadership development initiatives. How mindfulness and other contemplative practices can develop a more interconnected sense of self, foster collaboration, create more inclusive communities, and develop more effective leaders. What neuroscience has to do with it all. How you can implement this model to your organizations. Dr. Latha Poonamallee is Professor and Chair of Management at the New School’s Milano School of Policy, Management, and Environment. A long-term practitioner of mindfulness, she has developed her own blend of leadership development program combining state of the art neuroscience discoveries and ageless wisdom of contemplative practice. She is also the co-founder of a neuroscience startup that uses artificial intelligence to develop predictive analytics for brain health. 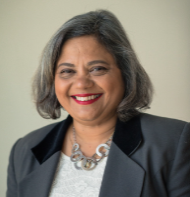 If you missed our February webinar, Foundation Fundraising for People of Colorwith Sujatha Jesudason, PhD, you can watch it here.